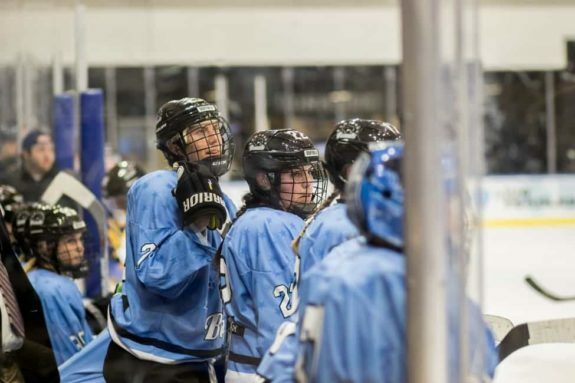 For a city—a true hockey town if there ever was one—that needed a professional championship, the proverbial icing on the cake took place at the HarborCenter on Saturday night, Nov. 11. Early (and unexpected) indicators inclined one to think that as the Buffalo Beauts raised their “2016-17 Isobel Cup Champions” banner and the championship rings were distributed to the players, that it would be a memorable night for everyone in attendance. More than that took place. The game ended up being a night of togetherness that swelled in the hearts of players, coaches and fans alike. The Beauts fed off of the festivities, and the crowd fed off of the Beauts. Not surprisingly, the energy built saw Buffalo skate to a 5-3 victory over the Boston Pride. Prior to the opening faceoff, the Beauts’ management and coaching staff from the Cup run assembled on the ice. Ric Seiling, Craig Muni, and Linda Groff-Mroz welcomed the players to receive their rings with hugs and handshakes. The Isobel Cup was perched in the center of a black-clothed table with the rings surrounding it. The players were announced one by one and included some old friends. Recently retired Beauts Brianne McLaughlin, Morgan Beikirch-Savino, and Kelley Steadman came to Buffalo to take part in the ceremonies. Current Boston Pride defender Paige Harrington did as well, even in full Pride uniform as she would be playing for the opposition after the banner was raised. Loud applause came down from the crowd as each player’s name was announced. It rang out even more as the banner was unfurled. It was a cheerful sight to see the team almost entirely together for one more time. Here is where a small twist comes in for the better. As a young singer (Maddie Radwan) came onto the ice to perform the national anthem, her microphone died after only a word or two. Not missing a beat, the entire Buffalo faithful continued to sing “The Star-Spangled Banner” along with her. Mic or no mic. That included players, coaches, media, even the Beauts public address announcer. Regardless, from the banner raising, to the ring distribution, and then the anthem saving, the Buffalo Beauts were energized once the puck was dropped. 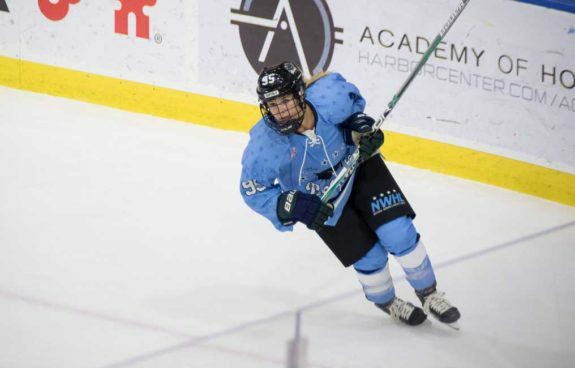 The leading goal scorer in the NWHL, rookie Taylor Accursi, talked about what seeing the banner raising and the ring presentation meant to the new Beauts such as herself. A forward who is seemingly a wizard with the puck, Accursi potted two more on this night against the Pride. In the 5-3 victory, she tallied the second and the fifth goals of the game for the Beauts. This young lady is simply on fire right now and is running with it. Accursi’s solid play in both the preseason and the two prior regular season games saw her receive a bit of a promotion. 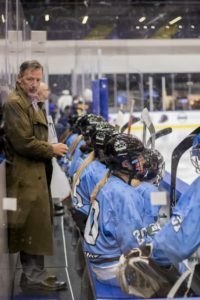 With Beauts sniper Jess Jones serving a single-game suspension, coaches Seiling and Muni moved Accursi to the top line with Corinne Buie and Rebecca Vint. That line clicked from the get-go and had multiple scoring opportunities during the night. Buie led all Beauts with eight shots on goal, while Accursi fired seven and Vint had five. It seems that all coaches Seiling and Muni need to do is play Accursi. Get her out onto the ice. Accursi has scored at least one goal in each of her three NWHL regular season games. Three of her five tallies have come on the power play and one has held up to be the game-winner. On this particular night, Accursi felt that she was clicking best with the team captain for the Beauts. There were two Beauts who scored the first goals of their pro careers during the game as well. Kaylyn Schroka, one-third of the “Adrian Line”, scored Buffalo’s first goal of the game and her first. The other first-time scorer was one of Buffalo’s most ferocious players, Maddie Elia. The 5-foot-10 Elia rifled six shots of her own on Pride goalies Brittany Ott and Brianna Laing. Elia plays the game with a controlled chaos. She is completely fearless of collisions or sticks that may come up into her face. Elia goes full bore every shift she takes. It is plain fun to watch her skate and forecheck. Elia’s goal was set up off of a beautiful pass from Buffalo veteran Kourtney Kunichika. The two formed a forward line with Hayley Scamurra, and all three clicked together most nicely. Kunichika is the only Beauts player on the club who has remained with the team since day one. She has not missed a single regular-season or playoff game for Buffalo since their inception. Elia spoke very highly of her veteran linemate. 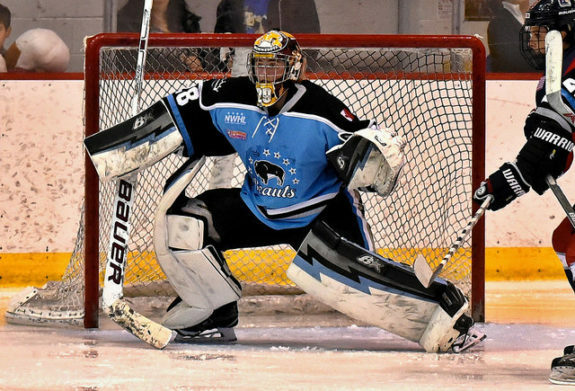 Beauts goaltender Amanda Leveille pitched arguably her best performance of the regular season thus far. Leveille has made three consecutive starts. While she did have a better save percentage and goals-against in the first game of the season against Connecticut, she faced more shots in the game against Boston and still posted comparable numbers. Leveille turned aside 29 of the Pride’s 32 shots. She would have a .906 save percentage on the night and now has a mark of .879 on the season through the first three games. Will Leveille Get the Start Again in Week 4? With the three straight starts and an upcoming rematch with the Metropolitan Riveters, one cannot help but wonder if Seiling and Muni will go with Leveille once more, or if they may give either Kelsey Neumann or Julia DiTondo a look. Leveille does not seem to mind the workload in the least, and she even discussed the difference between this current season and last year’s Cup-winning season. The pomp and circumstance have now come to a conclusion. The banner is up, the players have their rings, and the Buffalo fans and community have had their ceremony. It is only natural now that time and life go on. The Beauts have some business to take care of if they wish to retain the Isobel Cup. There are 13 more regular-season games to go, including a rematch with the Riveters on Nov. 18. The last time the two clubs met, the Beauts sustained a loss and a slew of penalties in a poorly officiated game. But it is time to move on. As Seiling agreed, it is what it is. “We have always taught and preached a disciplined game. We have always taught that from day one.” Seiling said. Buffalo’s 5-3 victory on its banner-raising night was not a walk in the park by any stretch. Yes, the victory belonged to the Beauts, but Boston rallied in the third and in the final 10 minutes. All Pride goals came in the third, and from a point when Buffalo was once up 4-0, things got a bit uncomfortable when the score became 5-3 at the 11:31 mark on a Mary Parker goal for Boston. Seiling recognizes that the season is still very young and his team is still learning. He and Muni have an interesting problem on their workbench—too many good players to try to insert into the lineup. 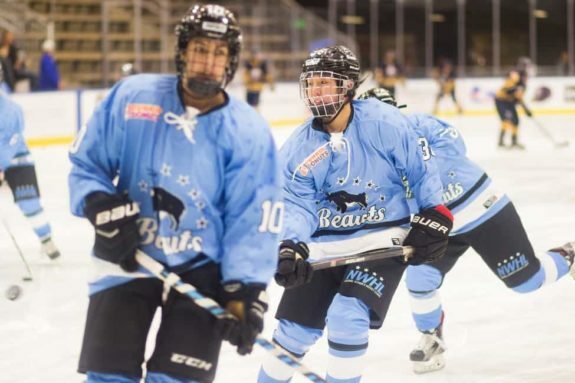 In the victory over Boston, solid Beauts players like Jordan Ott, Kathy Donohue, and Jessica Sibley were not even suited up as Seiling and Muni try to be both fair and find the right chemistry for a winning hockey club. It was made slightly easier for them because of the suspensions to Jones and Sarah Casorso, but that is essentially a one-time free pass. Stay tuned to see who plays in the upcoming game against Metropolitan, including a decision on the goaltenders.